The musical Singin’ in the Rain (did you know it wasn’t Singing in the Rain? ), starring Adam Cooper, Scarlett Strallen, Sandra Dickinson and Daniel Crossley has now closed at the Palace Theatre to standing ovations and rave reviews. Singin’ in the Rain Theatre Break are no longer available. Click the link to find out what is now on at the Palace Theatre. Singin’ in the Rain (are you sure it isn’t Singing in the Rain) is based on the classic 1952 MGM film with Gene Kelly, Donald O’Connor and Debbie Reynolds. The original cast from the Chichester production of Singin’ in the Rain (I’ve always said Singing in the Rain) will reprise their roles on the West End. We’ll see Adam Cooper as Don Lockwood, Daniel Crossley as Cosmo Brown, Scarlett Strallen as Kathy Seldon and Katherine Kingsley as Lina Lamont, with Michael Brandon as RF Simpson and Sandra Dickinson as Dora Bailey/Miss Dinsmore. Silent movies star Don Lockwood has success, fame and a well-publicised ‘romance’ with co-star Lina Lamont. But his life is about to change when a rumour goes around the studio about a new kind of film, one in which the actors actually need to talk… and sing… and dance. Scarlett Strallen’s was Mary in Mary Poppins both in the West End and on Broadway. Singin’ in the Rain Performance Times: Singin’ In The Rain shows six nights each week, from Monday to Saturday. almost a cliche for modern west end musicals; a weak story line tied to formuliac 'hollywood' as if most of us are not aware. cast performance was very competant but it is weak on story line and a little boring. the ' rent a crowd' youngsters brought in to make the audience enthusiastic didn't work (i sat behind american tourists and even they were scratching their heads about the response from certain sections of the crowd) if the only way to sell a musical is to offer up song and dance with a weak formulaic story then, thank you; i'll go elsewhere. 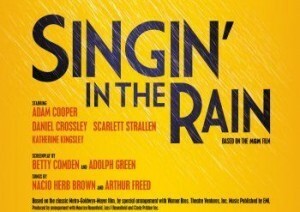 ‘Singin' in the rain’ is full of singing, dancing and acting, making me and all of the rest of the audience want to stand on their feet and join in with the cast. Katherine Kinsley, who played Lina Lamont, was fantastic, with her comical timing being spot on. The projections used to show their silent movies caused much hilarity among the audience with her squeaky voice. The dancing was wonderful, especially when they danced in the rain, splashing the audience during the song. The band played energetically throughout, making us clap along and feel thoroughly entertained and excited. The cast thoroughly deserved the standing ovation given at the end, illustrating just how brilliant they were when they went into their reprise of ‘Singing in the Rain’. Overall, the musical is definitely worth seeing, and will leave you with a smile on your face. There are so many words that could describe the current production of Singin’ in the Rain at the Palace theatre, London, but one word stands out (and even then, I don’t think it does it justice) A-M-A-Z-I-N-G! What a show! What an atmosphere – outside & inside the theatre. When we arrived the street outside was absolutely packed by excited theatre-goers. Inside, the theatre was packed to the gilt with excited theatre-goers. And I was very, very pleased to be one of them. From the opening overture onto the first dance number “Fit As A Fiddle” to the rest of the wonderful song & dance numbers – both Acts culminating with the audience soaking, laughter making title number - the show kept the whole audience enthralled throughout. My friend with whom I went, who is a lot younger than me & is not familiar at all with the magical world of MGM musicals was worried that she wouldn’t recognise any songs, but I told her not to worry. She was amazed by how many of the songs were familiar to her and loved it just as much as I did. The three leads – Adam Cooper, Daniel Crossley & Scarlett Strallen - are brilliant together. Their exquisite tap-numbers leave you agape with admiration and a touch of envy wishing you had that much talent! (At least I’m envious because my talent at tap classes whilst at drama school was minus zilch). I recognised one of the “names” - Michael Brandon, but Sandra Dickinson … well, what a revelation! She was SO funny as the ceremony announcer. All in all a must see for young & old alike. This production is absolutely flawless. The 10 minute standing ovation was well warranted. If there were more than 5 stars to give it I would willingly.